Following the announcement of seven Nobel Prize winners with MIT connections last week, United Nations Secretary General and MIT alumnus Kofi A. Annan SM ’72 was awarded the Nobel Peace Prize on Friday. Eight of the fourteen individuals awarded Nobels this year were either alumni, former faculty, or current faculty. 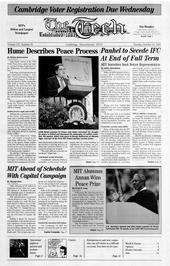 Annan was a fellow of the Sloan School of Management from 1971-1972, and delivered the 1997 commencement address. The prize committee reportedly selected Annan and the United Nations after the September 11 terrorist attacks, which was reflected in the committee’s statement. “The Norwegian Nobel Committee wishes in its centenary year to proclaim that the only negotiable route to global peace and cooperation goes by way of the United Nations,” the committee said. The United Nations has played a crucial role in building an international campaign against terrorism, and the organization is expected to lead the effort to build a post-Taliban government in Afghanistan. Annan, 63, was named the seventh secretary general by the United Nations in 1997, and was reelected in June. He has served the United Nations for his entire career, except for a two-year assignment with the Ghana Tourist Development Company in the 1970s. He studied at the University of Science and Technology in Kumasi, Ghana, Macalester College in St. Paul, Minnesota, and the Institut de Hautes Etudes Internationales in Geneva before coming to MIT. This year marked the centennial of the first Nobel Peace Prize. Past winners include Teddy Roosevelt, Woodrow Wilson, Albert Schweitzer, Martin Luther King, Jr., Mother Theresa, and Nelson Mandela. Last year, South Korea’s President Kim Dae Jung won the prize for his efforts to normalize relations with North Korea.